Patient is a 8.5 yr old, MN, German Shepherd that presented with a 2-week history of pain when moving the rostral end of the nose. Oral exam revealed no abnormalities. A CT scan of the skull was requested to further evaluate the nose/nasal passages and teeth. Radiographs of the skull: within normal limits. Patient was anesthetized and a CT scan of the skull was performed. Afterwards, Omnipaque™ (contrast agent) was administer and a post-contrast skull CT scan was acquired. 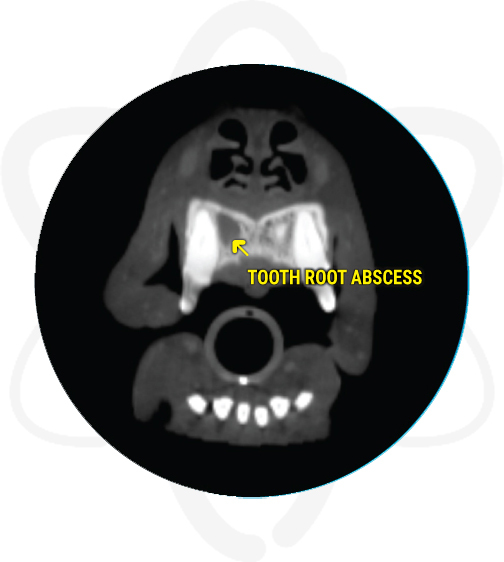 Focal lysis of alveolar bone associated with the right second maxillary tooth root (102). 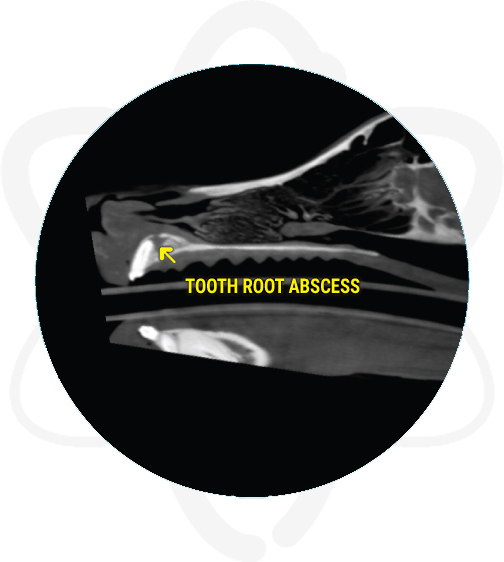 Differentials include tooth root abscess or early neoplasia. The remaining skull anatomy is normal. There is mild C2-C3 spondylosis deformans. CT discovered a reason for the patient’s clinical signs which was not seen on skull radiographs and provided further information for treatment plan. As shown in this case, CT scans are a great imaging modality in the evaluation of the dentition along with the rest of the bony structures of the skull, the nasal passages, soft tissue structures like the eyes, and others. Some of the most common indications for which we perform skull CTs include: chronic nasal discharge, swellings, chronic sneezing, epistaxis, periodontal disease, and middle vs inner ear disease among others.